“Supercytes – the immune cell standoff” is a new resource for schools, to be launched for academic year 2017/2018. Conceived and developed by Donald J. Davidson and colleagues at the MRC Centre for Inflammation Research at the University of Edinburgh, this is game-based educational pack designed to introduce immunology and inflammation and a lively and entertaining manner. The resource will initially be freely available in the Edinburgh and Lothians area. 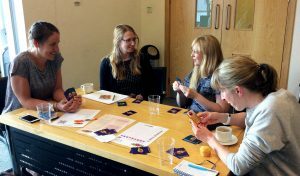 This MRC Festival of Medical Research 2017 event at the Queen’s Medical Research Institute, Edinburgh, was an interactive workshop to introduce the Supercytes resource to teachers working in Edinburgh and Lothians schools. 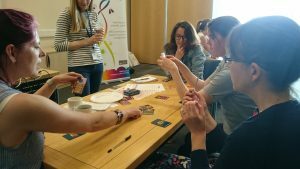 The event was a great success, with our cohort of 24 Secondary School Science and Primary School teachers learning to use the Supercytes resource, and getting as animated as the pupil trial groups when playing the game! 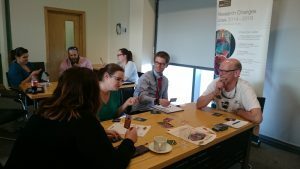 100% of attendees said that they would definitely use the Supercytes resource, and the group gave a mean rating of 6.7/7 for the quality of the workshop. Thanks to all the participants! I know this will change learning in the classroom. The resources are professional looking and I envisage captivating for students. I really like it. A novel approach to a complex area of Biology. There were multi level approaches and accessibility for a variety of students of various literacy and numeracy levels. Lots of scope to use creatively in an interdisciplinary topic. I learned something… my immunology has improved!